Anaseini Turagasela could not hold back her tears during her graduation ceremony yesterday at the Labasa Civic Centre because she misses her late father, Aporosa Turagasela, 51. The 27-year-old of Sasa Village in Macuata said it was her father’s dream to see her graduate from the Sangam Institute of Technology College of Nursing and Health Care Education and become the first nurse in the family. “It was during the first year of nursing when my father, while working as an engineer at Fiji Sugar Corporation, passed away due to some health issues,” Ms Turagasela said. 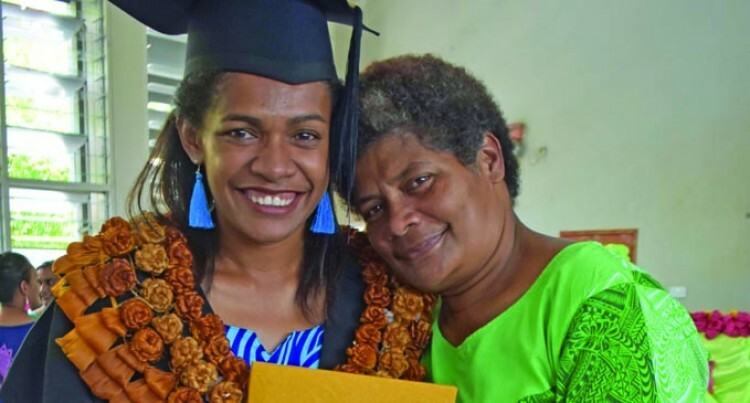 “My life totally changed and seeing my mother, Josephine Raikuna, 48, struggling drained out all my energy to continue studying. She praised God for his mercy and thank her lecturers for their support. Her mother, who is from Rewa, was also in tears when she hugged and kissed her daughter on the main stage. “Today I am a very proud mother,” Mrs Turagasela said.